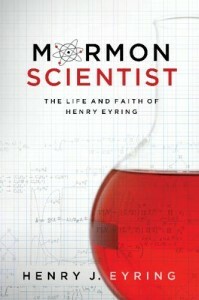 The following is taken verbatim from Mormon Scientist: The Life and Faith of Henry Eyring. Henry Eyring, father of current apostle Henry B. Eyring, was a world-renowned chemist who became the Church’s unofficial spokesman on scientific matters. The following segment (which can actually be downloaded in full from the book’s website) is a good example of the excellent tact and patience that Eyring exhibited when disagreeing with Church leaders. Henry continued to receive requests from Church leaders for his scientific opinions, particularly after 1954. That was the year that Elder Joseph Fielding Smith published a book called Man, His Origin and Destiny. In the book Elder Smith reiterated the position that scripture should be read literally as it pertained to the Creation. I hope my opinions offered for what they are worth will not seem presumptuous. Please feel free to make such use of this letter and the enclosed material as you may choose. Henry likely knew that, given this license, the letter would circulate. It did. Before long Henry heard from Elder Smith. In fact, it wasn’t the first time that Elder Smith had written him. Four years earlier, in 1950, Elder Smith penned a five- page letter to Henry, explaining his view of the creation of the Earth. The 1954 letter from Elder Smith was similarly lengthy, but the tone was more emphatic. Elder Smith stated his pleasure at Henry’s achievements and his confidence in the divine inspiration behind great scientific discoveries. However, he reiterated his contrary views and challenged Henry to respond. He also warned sternly against scientific arrogance, and he referenced and even quoted from Henry’s letter to Elder Bennion. Though the tone of Elder Smith’s letter wasn’t confrontational in a personal way, it seemed to invite a formal debate. Thanks for your letter of April 15, 1955. I am happy that you read my letter, which you refer to, as it expresses accurately my point of view. Given the differences in training of the members of the Church, I never cease to marvel at the degree of agreement found among believing Latter-day Saints. So far from being disturbed to find that Brother Talmage, Brother Widtsoe and yourself didn’t always see scientific matters alike, this situation seems natural and as it should be. It will be a sad day for the Church and its members when the degree of disagreement you brethren expressed is not allowed. I am convinced that if the Lord required that His children understand His works before they could be saved that no one would be saved. It seems to me that to struggle for agreement on scientific matters in view of the disparity in background which the members of the Church have is to put emphasis on the wrong place. In my judgment there is room in the Church for people who think that the periods of creation were (a) 24 hours, (b) 1000 years, or (c) millions of years. I think it is fine to discuss these questions and for each individual to try to convert the other to what he thinks is right, but in matters where apparently equally reliable authorities disagree, I prefer to make haste slowly. Since we agree on so many things, I trust we can amicably disagree on a few. I have never liked, for example, the idea that many of the horizontally lying layers with their fossils are wreckage from earlier worlds. In any case, the Lord created the world and my faith does not hinge on the detailed procedures. Thanks again for your kindly, thoughtful letter. A lively discussion ensued. As so often happens, each person brought up the argument which supported his position and we parted each with much the same position he held when the discussion began. But what was much more important, the discussion proceeded on a completely friendly basis without recrimination and each matter was weighed on its merits. So far as I am aware the matter ended there. No one was asked to conform to some preconceived position. The Church is committed to the truth whatever its source and each man is expected to seek it out honestly and prayerfully. It is, of course, another matter to teach as a doctrine of the Church something which is manifestly contradictory and to urge it in and out of season. I have never felt the least constraints in investigating any matter strictly on its merits, and this close contact with Elder Smith bore out this happy conclusion. Perhaps the most important point made during this argument between two highly regarded, intelligent men is the very fact that they accomplished an exchange of ideas and ended the interchange in a polite way. Neither opinion seemed to be swayed from their respective original positions of the “creation” matter, but they concluded their arguments with loving expressions of mutual respect regardless their continued disagreement. They artfully demonstrated that discussing contradictory positions on any given matter can be healthy when the hub of the wheel driving that exploration is centered in the love of our Creator who will make reality known to us when we are ready for it. Which side of the veil that happens on is His business. We are a lucky bunch of His children. It appears to me that Eyring had a bit too much faith in science while Smith had a bit too much faith in the scriptures as a source for scientific knowledge.